Operating carrier of code-share flight will provide service at airport and in-flight. Check-in process and service varies by flight. Please consult with JAL International reservation or your travel agency for details. When traveling on codeshare flights operated by partner carrier, the operating carrier's conditions of carriage may apply with respect to certain services. WS operating code-share flight, please click here. Each passenger is permitted one piece of carry-on baggage. A passenger may carry on board one personal belonging, such as a shopping bag or handbag, and one baggage satisfying the conditions below. If your baggage is oversized or overweight, or unable to be appropriately stowed in the cabin due to the stowage limitations, it may need to be checked in cargo compartment at the gate. Please switch off electronic devices in your checked baggage. Valuables should not be included in your checked baggage. For your own safety and comfort, please stow your Carry-on baggage under the seat or in the overhead compartments properly. If your baggage is not securely stowed, it may injure yourself or the others in case of turbulence. If you keep your baggage on a lap, it would hinder taking a proper brace position in case of emergency. *If you are seated directry behind screen, emergency exit or cabin separating wall and do not have a seat in front of you, your carry-on baggage may not be placed at your feet or on your lap. *If you are travelling on Business Class <JAL Shell Flat Seat> or Premium Economy Class <JAL Sky Shell Seat> , carry on baggage may not be placed under the seats in front of you upon departure and arrival. Please use the overhead compartments for stowage. JAL group altered the restriction of usage of electronic devices on board as follows on 1st September, 2014. This change was based on the ministerial notification regarding the related civil aeronautical act. Also, please turn off electronic devices in your checked baggage. *1 Please set electronic devices into airplane mode or turn off power after door closed. It is prohibited to access wireless LAN out of airplane. Your crew will notify you about electronic device usage after landing. Other electronic devices and electric products that do not emit waves when activated. *4 "Devices that do not emit radio waves when activated" means that the function to talk and to send e-mail/text is disabled even if the power is on, such as airplane mode. Your captain may request you to turn your electronic devices off depending on circumstances. Company rules restrict the use of electronic devices other than the above-mentioned devices. Personal computers, personal digital assistances and electronic game machines can be used during flight when you connect those devices with In-flight Wi-Fi service. Applying a powerful force on electronic devices with the lithium-ion battery can cause the battery deformation and/or the battery protection function failure. This may lead to the battery failure with heat generation, burst, ignition. Please be careful not to drop the electronic devices to the floor, not to stomp on them and not to drop them into the gap around the seat. We may ask you to turn the electronic devices off when passengers with medical devices like pacemaker are around you. Please pay attention to the safety announcement and other safety-related insutructions provided by the cabin attendants. Please be considerate of other passengers when you use electronic devices on board. Also please refrain from talking on the cell-phone in the cabin because this may disturb the others. During take-off and landing, please stow the large size of electronic devices like notebook computer into the overhead stowage bin or under the seat as well as your baggage. Please switch off electronic devices in your checked baggage. Please obey the operator's rules when you board codeshare flights. Kids Phone by NTT Docomo, Junior Phone by au and Mimamori Series by Softbank must be turned off completely in advance. Some airports may employ CT scans for baggage reinspection, in addition to standard X-ray scans. The increased X-ray exposure may affect photographic film. Therefore, it is recommended that you carry your photographic film with you into the cabin with your carry-on baggage. With JAL, up to two pieces of baggage can be checked in for free*. * Please switch off electronic devices in your checked baggage. * Valuables should not be included in your checked baggage. * Under IATA provision, U.S. Department of Transportation and Canadian Transportation Agency order, below may not be applied if your itinerary includes flights operated by other airlines (including codeshare flights).Please check each checked carrier's baggage rule. Infants entitled to a seat Follow the boarding class A fully collapsible stroller, carrying basket and car seat for infant or child may be accepted without charge. Infants not entitled to a seat 1 piece with same total linear dimensions (length+height+width) and weight as accompanying adult. * 32kg (70 lbs) for passenger travelling to/from Brazil connecting from/to JAL (JAL operated flight) within 24 hours. Passengers must fly over the pacific ocean when traveling to/from Brazil. Note: Other rules apply to passengers entering or departing from the US. Please click here for more information. Note: As cargo space is limited on each type of aircraft, please understand that we may be unable to load all checked baggage on the flight. Note: It will be refused to carry as Checked Baggage in case it is not properly packed in a suitcase or other suitable container to ensure safe carriage and conveyance by the baggage belt. If the baggage consists of two or more parts, it should be packed or wrapped wholly and securely to avoid the separation.Otherwise, it cannot be checked-in as 1piece as that may damage other baggages or the airport facility. For baggage in excess of the free baggage allowance, an excess baggage charge applies under JAL regulations. (*)For the case of departure from Canada, CAD is applicable. For the case of departure from countries other than Japan and Canada, applicable charges in USD will be converted to local currency. Note: Maximum checked baggage per passenger is +7 pieces on top of free baggage allowance of each boarding class. Note: Baggage weighing more than 45 kg (100 lbs.) will not be accepted as checked baggage. Note: Excess charge will be summed up if the baggage is applicable for different types of charges. Charges for each pet container will be assessed according to the route. Note: Only dogs, cats, certain household birds, rabbits, ferrets, hamsters, guinea pigs, squirrels, and chinchillas are acknowledged by JAL as "Pets". Note: At the time of reservation, we will ask your crate size (width/height/depth), total weight of your pet and crate together, type and age of your pet. There is a limit of size and number of pet crate per each aircraft types. We might need several days to confirm your reservation due to the limited space of each aircraft. Note: Surfboards:Maximum of 2 surfboards per each carry bag. Windsurfing:One board, one mast, boom and sail per set. (*)If your surfboard or windsurfing equipment exceeds 120cm (100cm if the aircraft is 737) in length, please consult with JAL International reservation or your travel agency in advance. (*)Other sports equipments will be handled as normal baggage and will be charged extra baggage fee under JAL regulations if weight or size is over free baggage allowance. If your baggage is oversized or overweight, it may not be accepted on our flights because the space in cargo compartment is limited. Please consult with JAL International reservation or your travel agency in advance if you are carrying the followings. -The height exceeds 150cm (59in.) (*) and must be kept upright throughout the duration of the flight. (*) 79cm (31in.) for 737 aircraft. - Large musical instruments such as cello, contrabass and etc. Checked baggage exceeding 200cm×90cm×90cm for 1piece cannot be accepted in principle due to airport facility. Please contact JAL International reservation or your travel agency for further information in advance. It is prohibited by law to carry dangerous goods into the cabin or to include them in your checked baggage. There is a limit to a Carrier’s liability for checked baggage. Passengers may pay the prescribed excess value charge for valuable items at the time of check-in to raise the limit of liability to the declared amount up to US$5,000. When travelling on a codeshare flight the free baggage allowance shown on your ticket will apply in principle. Please consult with JAL International reservation or Operating carrier or your travel agency for details. It is prohibited to carry any item that could be used as a weapon into the cabin. 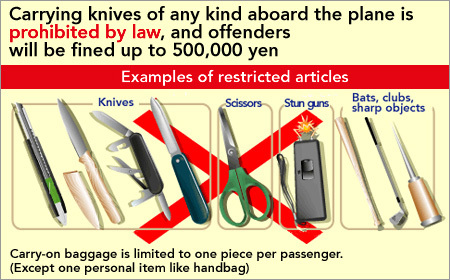 Carrying a knife or other restricted item into the cabin is a violation of Japan's Aviation Law and subject to a fine of up to 500,000 yen. If you are found to be carrying such items at a security check when departing from the US or another country outside of Japan, you may be subject to fines under the laws of that country. The following items cannot be carried onto aircraft and should be placed in checked baggage beforehand: knives, blunt and/or heavy items that could be used as a weapon, sharply pointed items, and any other items that could be used as a weapon. New restrictions on liquids, gels and aerosols as carry-on baggage. For the items which are not accepted as Checked baggage or Carry-on baggage, Please check the following JAL regulations. Documents, electronic data, passports and other personal identification required for travel, samples, credit/bank cards, cash vouchers, bankbooks, checks, commuter passes, keys, computers and computer accessories, mobile phones, film cameras, digital cameras, video cameras, medication, paintings, watches, mementos, etc. JAL will not be liable for any damage to fragile articles such as musical instruments, sports equipment (including golf club, surfboard, windsurfing equipment, diving equipment, bicycle, etc. ), ceramics, glass articles and liquors, if the damage result from the inherent defect, quality or vice of the item, although adequate precautions will be taken in their handling. JAL also does not assume liability for the following damage to baggage, although adequate precautions will be taken in their handling. Damage to baggage from excess weight or over packing, or owing to defects in the baggage itself such as from normal wear and tear. Loss of protruding parts such as detachable wheels, straps, hooks and name tags. Minor damage such as scuffs, cuts, dents and dirt. Damage caused by TSA (Transportation Security Administration)Inspection. We aim to always deliver our customers' baggage to its destination. However, from time to time baggage may be damaged or delayed due to bad weather or technical problems. Please accept our sincerest apologies if you have suffered any such issue. In an event such as the above, JAL will do our utmost to resolve the problem.